Dharmaraj Cheralathan who is playing for the Puneri Paltan in this of pro kabaddi league season has played for Patna Pirates, Bengaluru Bulls and Telugu Titans in pro kabaddi league season 2, 3 and 4. The 41-year-old defender Cheralathan comes from a family of farmers. He says “Farming was all that was important to me while growing up. Even my brother is a farmer. We spent a lot of our young days working in the fields.” Cheralathan’s brother D Gopu is also a defender just like his brother and was seen playing for Dabang Delhi in last season of Pro Kabaddi League. Dharmaraj Cheralathan, referred as Anna by his teammates. The shy Cheralathan revealed, “I started playing Kabaddi at an early age and enjoyed playing it. I never thought it would bring me to this stage.” Before playing for Puneri Paltan Cheralathan played for the Patna Pirates, Bengaluru Bulls, and Telugu Titans in pro kabaddi league season 2,3 and 4. Now he has been bought by the Puneri Paltan at the auction pro kabaddi league season 5. Dharmaraj Cheralathan is an expert at both the right and left corner. 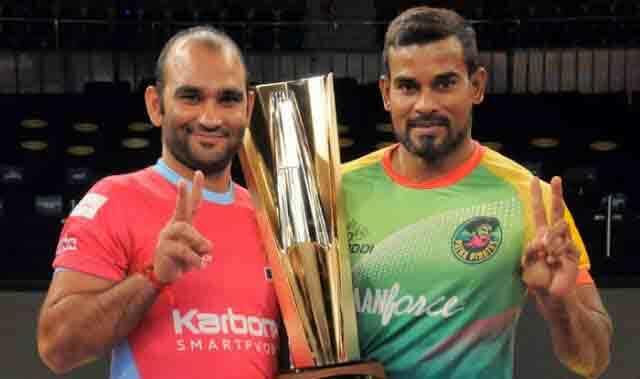 “I know what it takes to be a champion side having led Patna Pirates to victory last season and the goal will be again to clinch the gold in the coming season,” said an extremely fit and confident Dharamraj Cheralathan. “The emphasis in training [now on in Pune] is fitness with a dedicated one full session daily. I feel that we have the best blend of offence and defence and with lots of experience too. The likes of Manjeet Chillar, Deepak Hooda, Sandeep Narwal, Rajesh Mondal are stars in their own way. We should reach the final and hopefully win the title too this time as the coach P.C. Ramesh is good,” added Dharmaraj. Cheralathan also played for Patna Pirates in pro kabaddi league season 4. Patna Pirates is a winning team of Pro Kabaddi League season 3 and 4 with Sanjeev Kumar who currently serves as a coach for the Patna Pirates team.